home > How to pick sensational summer fruits! How to pick sensational summer fruits! There’s so much to love about summer, but fresh, juicy and delicious summer fruits are one of my favorite things about the season. I work these fresh flavors into entrees, appetizers, salads, and desserts whenever I can. But what I love best is simply snacking on them straight from the farmer’s market…or better yet, straight from the garden. A quick wash and sun-ripened summer fruits are absolutely heavenly, all on their own! But choosing fruit that’s perfectly ripe and flavorful can be tricky. Here are some of my tips for selecting summer fruits at their very best. Strawberries don’t continue to ripen once they are picked like some other fruits. So be sure to look for plump berries that are completely red, with fresh green leaves around the top and no white or green spots on the berry itself. But even the most beautiful, lush, red strawberries can sometimes be deceiving and flavorless. The true test is the sniff test. Strawberries should smell even better than they look! So be sure your berries smell delish before you buy. If you ever do select berries that are a little too tart for your liking, an easy fix is to slice them, sprinkled them with sugar and then let them sit for about 30 minutes. The juices and sugar will combine to form a natural syrup that imparts just enough sweetness to make the most of any strawberry! 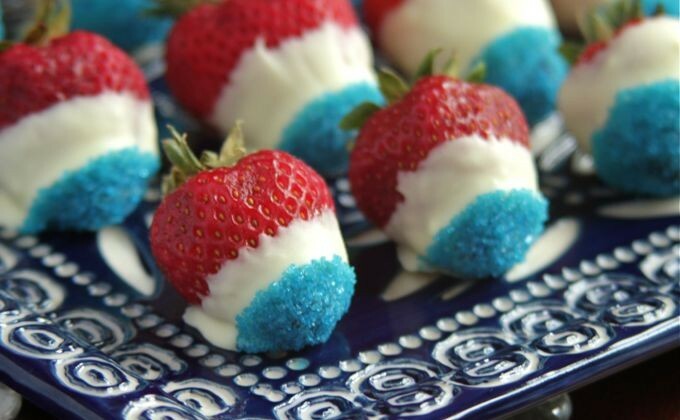 Just in time for your 4th of July festivities…here’s a festive way to serve up perfect strawberries in patriotic style. I am lucky enough to live near a great local source for blueberries…right next door in New Jersey! Here’s what I look for in delicious blueberries: plump, deep bluish-black berries, with not a hint of red or pink. If your blueberries look like they have a silvery or frosted appearance, don’t let that scare you away…it’s actually a sign of freshness. Unlike other berries, which give off a great aroma when perfectly ripe, blueberries don’t have much of a scent. So the best way to test for flavor is to actually eat a few! That’s why I love farmer’s markets…most vendors have a supply of washed samples, ready for the tasting. Have a bumper crop of beautiful blueberries? 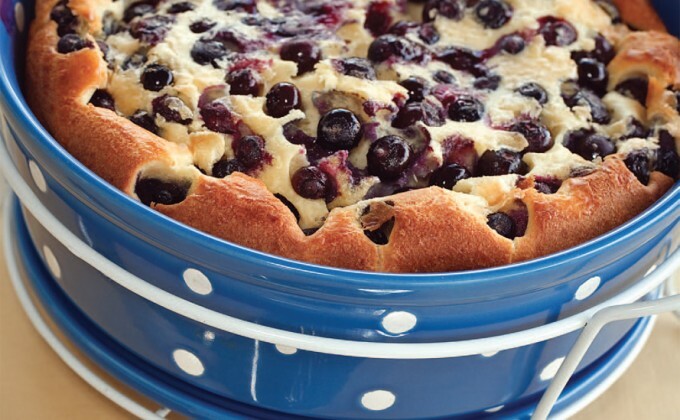 Whip up this Deep Dish Blueberry Pancake recipe…YUM! Sweet or tart varieties, I love them all! (They’re the inspiration behind my Cherry Jubilee Mixing Bowl, after all!) Look for deep saturated color on the cherries themselves, whether they are solid or variegated varieties like Rainier cherries. The skin should be taut and shiny…wrinkles or loose skins are a sign cherries have been sitting out at room temperature too long. And here’s one more tip: check out the stems. Plump, unblemished cherries with supple, green stems often have the freshest flavor. Picking the perfect peach is a sensory art. First, gently squeeze it, using your whole hand (if you pinch it with just your fingers, you’re more likely to bruise it). It should give slightly to the pressure. Then smell it; fresh peaches should smell irresistible! Finally, look it over carefully…even a tinge of green means you should steer clear. If you can’t find a perfect peach, pick one that’ slightly under-ripe. Let it sit for a day or two in a paper bag and it will ripen to perfection in a day or two! But keep in mind this trick won’t work miracles with a rock-hard peach. Better to slice and grill under-ripe peaches to salvage sweet summer taste! 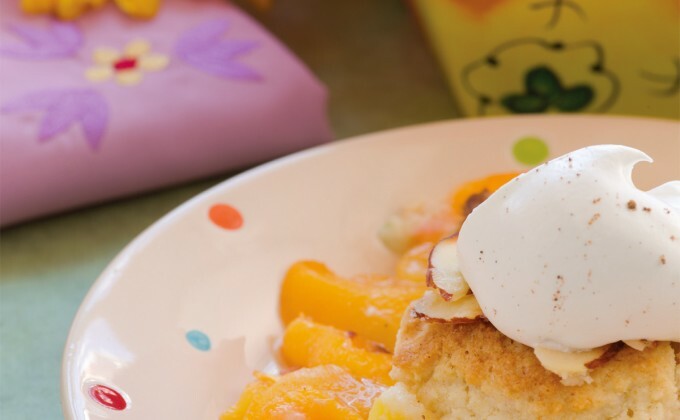 Once you find those perfect peaches, make this family-favorite…Peach Cobbler. First, pat or thump a few and compare what you hear. You’re looking for a deep sound, not shallow. A muffled thud sound tells you it’s over-ripe. If you have a few contenders, choose the one that feels heaviest, for a super juicy melon. Another tip is to look for a pale underbelly…a sign that the melon has had plenty of time to ripen in the sun. Did you find a great watermelon? 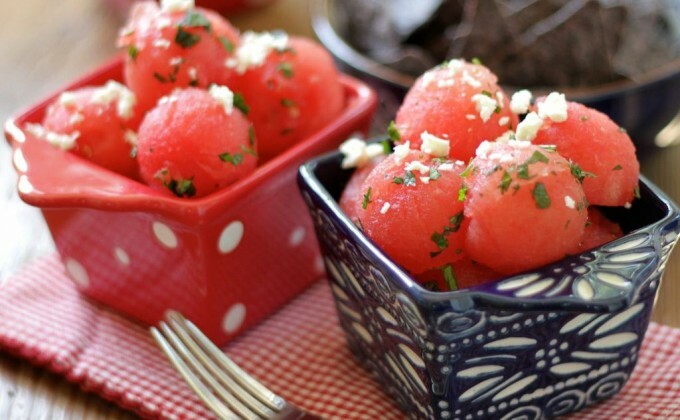 Try my Watermelon Salad! Have any tips or tricks you’d like to share about your favorite summer fruits? Add them to the comments below. Wishing you happy (and juicy) summer snacking!